For many children, entry into the 3's provides their initial experience with school. Our program is designed to encourage exploration and create a feeling of safety and security in what may be their first experience away from home. Children work with open ended materials such as blocks, sand, paint, crayons, paper, play-dough, and puppets to express what they see and what it means to them. Social skills are an important aspect of the development of three-year-old children. 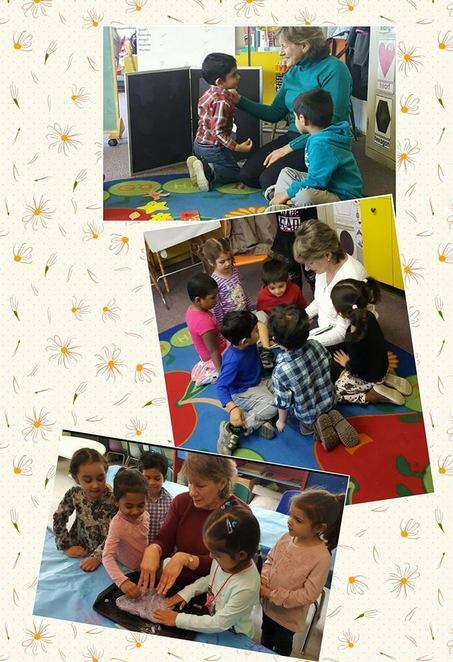 We focus on such skills as sharing, communication, socialization, following directions, eye hand coordination, large and fine motor development. These are goals for our three year old classrooms. Using individualized instruction, theme teaching, small group, and large group learning environments we attempt to achieve the goals listed below. However, please remember that each child is unique and will develop socially, emotionally, as well as academically at different rates of development. Young children learn best through play. Play enhances language development, social skills, problem solving skills, and decision making skills. Play time is an essential part of our school day. The alphabet will be introduced in a fun, multisensory way. The children will learn how to spell their names. We work with phonemic awareness using songs and rhymes, and identifying initial sounds in words. We introduce the children to children’s literature during our daily story times. Vocabulary development will be encouraged through finger plays, music, story time, playtime and circle time activities. The focus is on developing hand strength and fine motor skills. They have many opportunities developing their fine motor skills by coloring, drawing, painting, cutting, molding with play dough and using small manipulatives such as puzzles, pegs & blocks. They learn how to form capital letters using large manipulatives. Children will be introduced to holding writing implements correctly, tracing, cutting on lines, and writing first name. At the preschool level we work on concepts of shapes, sizes, colors, patterns, sorting, graphing, more or less, calendar skills, beginning numerals and counting. Our science program is a hands-on curriculum. The children have experiences planting seeds, watching the metamorphosis of a butterfly, studying the five senses, studying animals and insects, and observing the weather and the changing of the seasons. We begin each year learning about ourselves and our friends. We learn that we are part of a family and live in a neighborhood. We study about community helpers and the important jobs they do. We spend a portion of each day in the gym to give children a chance to use their active growing bodies and develop their large motor skills. The children will have ample opportunity to develop their large motor skills by running, climbing, and throwing, catching, and kicking a ball. They will have daily opportunity to pedal tricycles.